We had an incredible experience at Hostel One Catedral! Every staff member was extremely organized, welcoming, and helpful throughout our 2 days spent there. The room and facilities were very clean, and the free dinner and breakfast snack was always delicious and made us feel at home. One of the workers even walked around with us and showed us the best spots to go in Sevilla to watch the processions for La Semana Santa!! I would absolutely recommend staying here if you want a great time!! I have been traveling for months & Hostel One Catedral is hands down the best hostel I have ever stayed in.. Since the moment I walked in, I was greeted by the friendly staff and they even saved me a plate from the dinner because I checked in late. I extended my stay 2 times because it really felt like home on my stay here. Everything is super clean and comfortable and super cozy & their free pub crawl is amazing.. I loved how I had the option to chill and relax or party.. This is the most social hostel I've been to in Spain. The staff were absolutely awesome, big shout out to France, Canada, Mexico and Argentina! They even hostel a game of thrones viewing 3am in the morning when the episode came out. The vibe here made me very happy, make sure to go out to the pub crawls! What an amazing hostel with the best staff! Great location close to all the main attractions. The nightly dinners were delicious and a great way to meet people as a solo traveller. Seriously I cannot recommend this hostel enough! One of the best hostel I've ever stayed in.. Staff are extremely friendly, helpful and welcoming. There is a real family vibe in the hostel which makes everyone feel welcome and gets people involved. The food was good and communal dinners are a great way to start an evening. The location is right in the heart of the centre giving you all the sights on your doorstep. 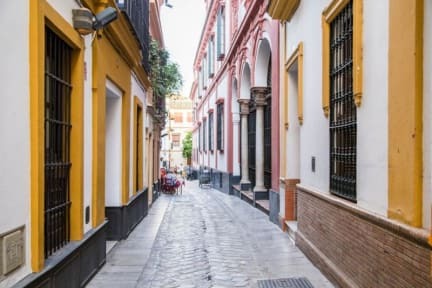 I stayed 3 nights over semana santa which is one of the busiest festivals in Seville and picked this hostel as it was around the corner from the main cathedral. This hostel exceeded all my expectations, I loved how clean everything was, the comfy beds, the welcoming staff who would all have a chat with you and help as much as possible. I highly recommend this hostel if you are travelling solo, I met so many wonderful people at the free dinner! Highly recommend hostel one! The staff were extremely friendly and accommodating, the terrace made for a wonderful view and great place to relax/meet new people. The rooms were all clean with all the amenities one would expect. Giving both breakfast AND dinner definitely added to the value for money. I went during an expensive week because of the festivities but other than that it was wonderful hostel stay! Thank you! Decent hostel. Comfy bed. Free dinner was pretty poor but you get what you pay for. Fun group of people working there and try to get everyone together for the pubcrawl at night. Right in the middle of town so easy to get everywhere.